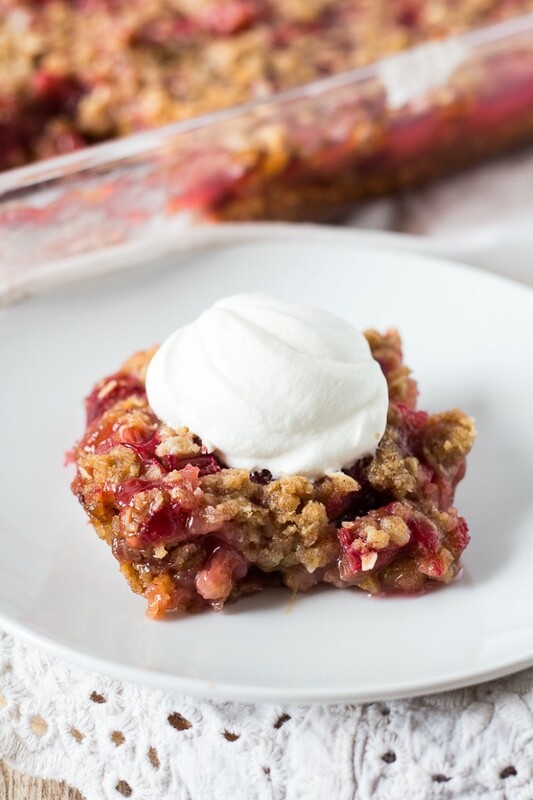 This year I have several more great rhubarb recipes I’m planning to share and we’re starting off with this rhubarb crunch. I had never made it before, but I kept stumbling across the recipe in my research on vintage rhubarb recipes and so I had to try it. It’s similar to crisp, but it has an oatmeal crumble layer on the bottom as well as a top. Similar to a bar, but still gooey enough to eat with a spoon. It’s perfect with a scoop of vanilla ice cream or a dollop of freshly whipped cream. It’s also very sweet with a generous amount of brown sugar in the crumb layers and plenty of white sugar for the filling. Most all of the rhubarb crunch recipes I found were nearly identical. The one below is a combination of two I found in some of my church cookbooks. 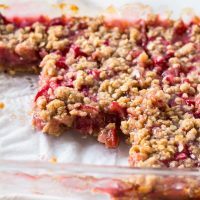 How to Make Rhubarb Crunch? First you’ll start by making a brown sugar oatmeal crumb layer. Melt some butter and add oatmeal, flour and brown sugar. Mix until crumbly. Press half of these crumbs on the bottom of the pan. Then top with some chopped rhubarb. You can use fresh or frozen. If you choose to use frozen rhubarb. 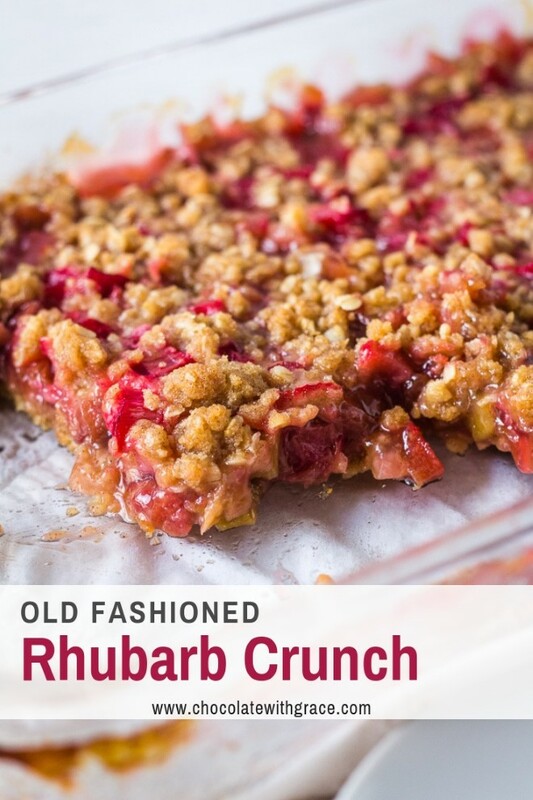 See my section below on how to use frozen rhubarb in this rhubarb crunch recipe. The next step of the recipe is what makes the rhubarb crunch unique. You boil a mixture of water, sugar and cornstarch until thickened and bubbly. Then pour it over the rhubarb in the pan. Top with the remaining half of the oatmeal crumb mixture and bake for about an hour. 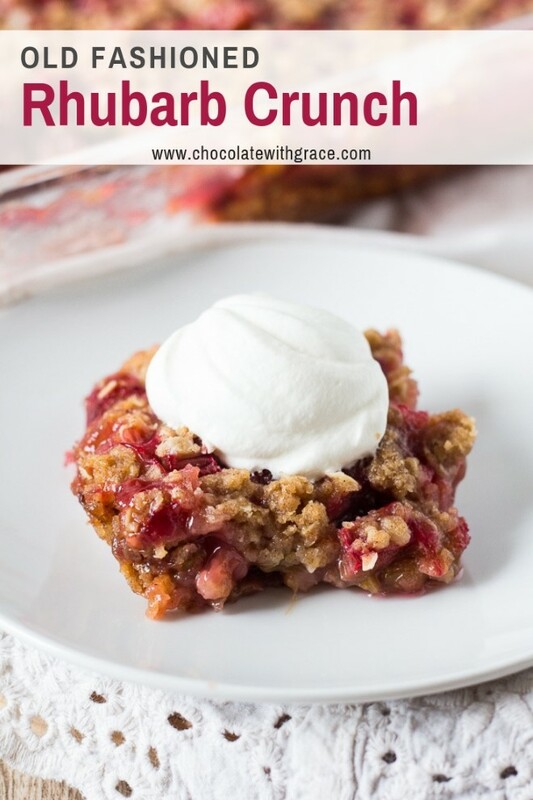 Like a rhubarb crisp, I think it is best served warm with ice cream or whipped cream, but the leftovers were sure delicious the next day, eaten cold straight from the refrigerator. 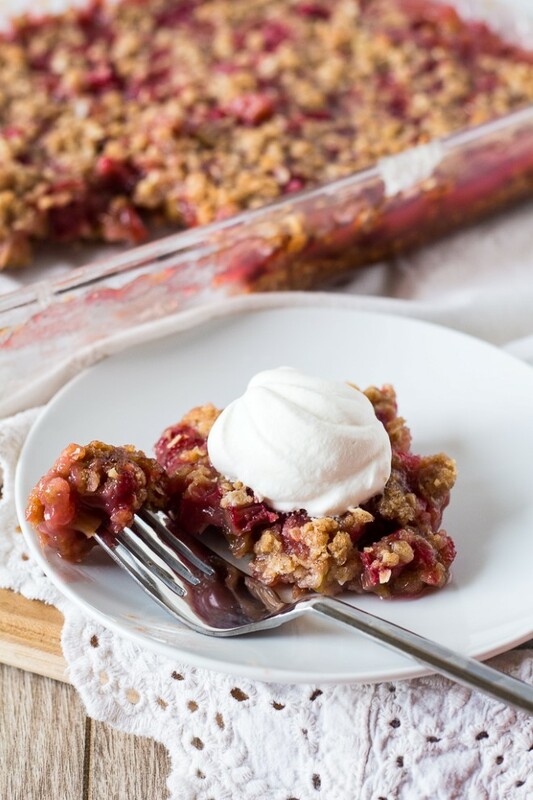 How to use frozen rhubarb in this recipe? You can make this recipe using fresh or frozen rhubarb. If you choose to use frozen rhubarb thaw the rhubarb first and let any excess liquid drain off. Don’t squeeze any liquid out, just drain what naturally thaws out of the rhubarb. You’ll want to plan ahead to use frozen rhubarb. Depending on the temperature of the room, it takes 4-6 hours to thaw a quart of rhubarb completely. So you may want to take it out of the freezer the night before. When in a pinch, I’ve also used the auto defrost feature on the microwave to give it ahead start, just be careful not to heat it too high and cook it. You just want to quicken the thawing process. 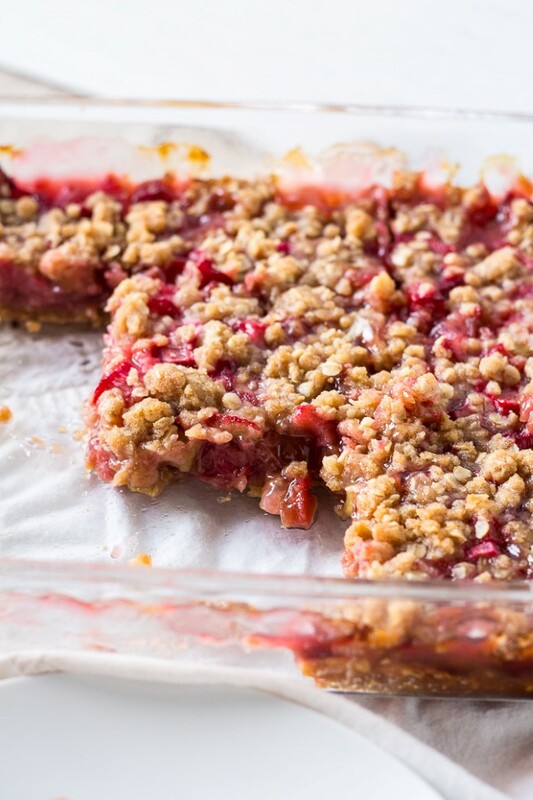 These Rhubarb Bars are one of the most popular recipes on my site. Just try them. Rhubarb Coffee Cake makes a delicious addition to breakfast or brunch. 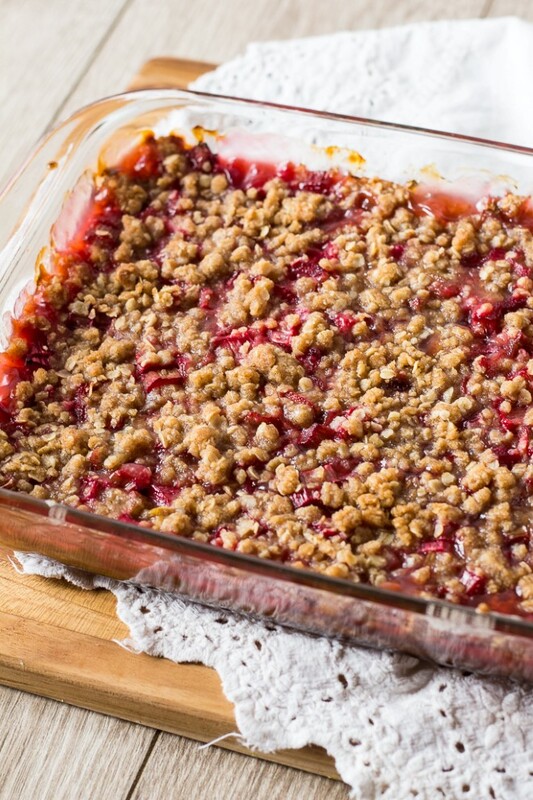 Have you ever made rhubarb crunch? Was it a family favorite growing up? Let me know in the comments. Preheat oven to 350° F. In a medium bowl, combine the flour, oatmeal, brown sugar, melted butter and cinnamon until crumbly. Press 1/2 of the crumb mixture into a greased 9 x 9 inch or 11 x 7 inch baking pan. Spread the diced rhubarb in the pan. In a small saucepan, combine the white sugar, water and cornstarch. Bring to a boil over low heat. Continue to cook and stir until the mixture is thick and clear. Pour over the rhubarb in the baking pan. Top with the remaining 1/2 of the crumb mixture. Bake for 1 hour. Cool at least slightly before serving. To serve, cut into squares and top with ice cream or whipped cream. Best served warm. This totally reminds me on my childhood. My mom used to make this for us all the time. I just love rhubarb. LOVE this sweet treat. Perfect with homemade whipped cream! This was really amazing! Everyone at my house loved it! Yum! This is a great dessert, and perfect with some ice cream.